Aliases: "Enemy of the Underworld"
Powers/Abilities: Mister E possesses no known superhuman abilities, though he is an expert marksman and highly accomplished athlete. Mr. E is trained in hand-to-hand combat, basic acrobatics and other athletic disciplines. He is also a formidable private investigator and skilled driver. He carries twin .38 caliber, six-shot handguns. 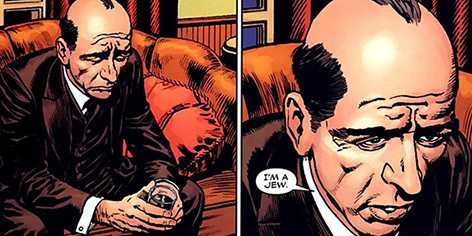 (The Twelve I#3 (fb) ) - Born Victor J. Goldstein, the man who would become Mister E soon realized that his Jewish heritage would work against him in the largely antisemetic early 1900s United States. Therefore, he changed his name from "Goldstein" to "Jay" and all but abandoned his roots, even laughing and agreeing with bigots as he made his fortune. His family, wife Laura and son Robert, initially didn't seem to mind the name change. 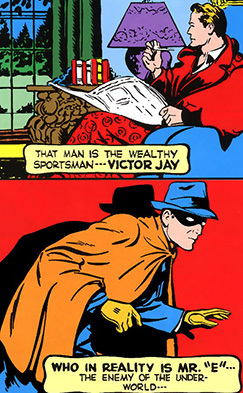 (Daring Mystery Comics I#2/6 (fb) ) - Now a wealthy raconteur and beloved businessman and sportsman, Victor Jay was moved to become a masked vigilante to help keep his community safe. As Mister E he set out to become an enemy of the underworld. 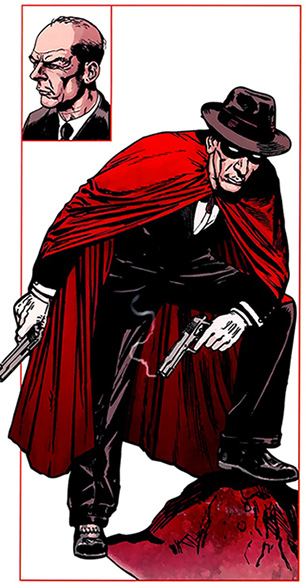 (Marvels Project#2) - By 1939, Mister E began to make a name for himself as a New York based vigilante crimefighter. His exploits were frequently covered by Daily Bulletin reporter Allan Lewis. Eventually, E's exploits, as well as those of the Avenging Angel and the Fiery Mask, inspired him to assume the role of the Phantom Bullet. 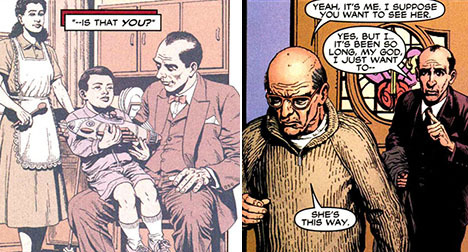 (Daring Mystery Comics I#2/6 (fb) - BTS) - Mister E had frequent run ins with a villain known as the Vampire. Over time, he started to consider him his archenemy. (Marvels Project#6) - Early in 1940, the ongoing conflict between Namor and the Human Torch (Jim Hammond) resulted in the Sub-Mariner flooding New York City with a massive tidal wave. Mister E and several other masked vigilantes aided relief workers, with E saving at least one woman. (Daring Mystery Comics I#2/6) - In 1940, Mister E investigated the seemingly unrelated deaths of four of the country's captains of industry over several weeks. He discovered that all four had been silent partners in the Snead Oil Company. He went to question J.P. Snead, the owner. When he arrived, Snead was throwing a note (about which he seemed quite upset) into his fireplace. Mister E quickly burst in and grabbed the note out of the fire. Though the message was partially destroyed, it was clearly a demand for a million dollars. As Mister E drove back to his home, he was run off the road by another car, and narrowly escaped from his own as it plunged over the cliff into a mudhole. The other driver was his old enemy the Vampire. Mister E returned home, and, on the night prescribed by the note, headed for Snead's estate. There he stowed away on Snead's car as the oil tycoon headed for his rendezvous with the Vampire. When he tried to sneak inside, however, the Vampire got the drop on him, taking him to his lair beneath an abandoned house. There, Mister E was tied to a chair, where the Vampire told him that he had killed the oil company partners even though they had met his demands, and that he would do the same to Snead himself. The Vampire then set a device that would detonate dynamite concealed in the house in one hour, burying Mister E under tons of rubble, and went to his meeting with Snead. Mister E was able to move himself and his chair to a nearby stairwell, falling down the stairs and breaking the chair to pieces. Free, he quickly rushed to the meeting room, where the Vampire was about to kill both Snead and his daughter Betty. Mister E drew his gun on the Vampire, but it was knocked out of his hand when the extortionist hurled a rock. The two began fighting, and the Sneads were able to escape, but the imminent arrival of the police, alerted by neighbors, led the two masked men to break off their struggle and retreat to their respective homes. The next day, Snead and his daughter told their friend Victor Jay about the way in which Mister E had saved their lives. 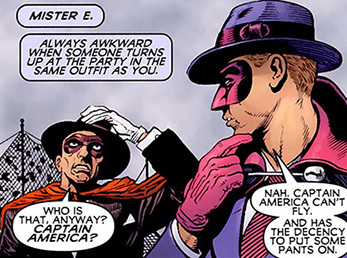 (The Twelve: Spearhead#1) - Mister E and a number of masked vigilantes joined the war effort and travelled to Western Europe along with the United States army. In early 1945, they had reached Germany. During this time, E frequently associated with the Phantom Reporter, another non- superpowered gunslinger. Together, they observed that they had no idea who half of the other so-called superheroes were who were stationed there, briefly mistaking Captain Wonder for Captain America. Later that night, Mister E attended the special USO show put on by the popular entertainer Blue Blade, though he and the Reporter left early because of its inherent cheesiness. They ran into the Witness, who told them of the horrors he'd just seen when he helped liberate Auschwitz. The stories struck a particular cord with Victor, especially when he heard all the victims were Jews. (The Twelve I#1) - On Wednesday April 25th, 1945, the Allies began their final assault on Berlin. Mister E and eleven other vigilantes found themselves teaming up to investigate the largely abandoned headquarters of the SS for possible snipers or other opposition. The search led them to an underground lab facility which actually turned out to be a trap. Once they were all inside, the doors closed and a special knockout gas was pumped in. SS officers hurried in to put the heroes in freezing tubes, planning to study and dissect these "supermen" after the war so they could turn the next generation of Nazis into a true master race. (The Twelve I#1 - BTS) - The SS officers hadn't counted on the Russian army reaching strategic parts of Berlin before the allied forces. The Russians captured and executed the SS officers responsible for keeping Mister E and the other heroes on ice. (The Twelve I#12 - BTS) - All the heroes were bombarded by the continuous cybernetic thought waves of the robot Electro who was desperate and alone after the impenetrable bunker cut off his connection to its inventor Philo Zog. Eventually, he'd form a bond with the android Dynamic Man, but the continued exposure to Electro's brainwaves left all the heroes present uniquely capable of connecting with Electro. (The Twelve I#1 - BTS) - In recent years a German construction crew accidentally unearthed the underground facility where the heroes were being kept. The American authorities were informed and quickly took charge of the situation, bringing everyone back to the United States where they were revived and led to believe it was still the 1940s in an attempt to gently accommodate them to having been asleep for the past 60 years. (The Twelve I#1) - Phantom Reporter and Captain Wonder eventually saw through the ruse, forcing the military to inform the others of their current predicament as well. Mister E and his compatriots all agreed with the army's offer to help them get adjusted so they could be what they were before: heroes serving their country in its hour of need. (The Twelve I#2) - Mister E and the others moved to a luxurious mansion outside of New York supplied and funded by the army. They were welcome to stay there rent- and expense free for 12 months while they got their bearings in this new world. (The Twelve I#3) - The US army helped Victor track down his family. He was surprised to find both his wife and son were still alive, though they had apparently changed their name back from Jay to Goldstein. He went to the address he was given and met with his 68- year-old son Robert who he'd last seen when he was just a boy. Bitter and angry after a lifetime of feeling abandoned by a father who had denied even his own birthname, Robert informed his father he could have five minutes with his mother, but that he didn't want anything else to do with him. As soon as he'd read his father was still alive, Goldstein Jr. had taken legal action to prevent Victor from claiming both the family fortune and the house. Already shaken up by all this, Victor broke down even more when he was led into his wife's bedroom to find her barely conscious in bed on a respirator. After sitting with his wife for a while, he left and returned to the Twelve's mansion. There, he told his surprised associates that even though his family wanted him to come back and live with them, he felt dutybound to aid the heroes for the time being. 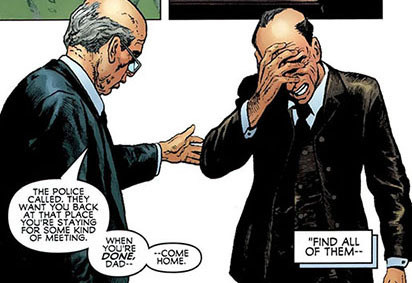 (The Twelve I#4) - The unpleasant and confronting encounter with his family left Victor emotionally frazzled. He kept to himself for days, though he did attend the going away party of Master Mind Excello who had reclaimed his enormous wealth and had decided to move out. During the get-together, he revealed to the Witness that he was a Jew. All the stone- faced vigilante said in reply was that he was Jewish as well. Later that night, the active denial of his true heritage continued to haunt Victor while he tried to get to sleep. (The Twelve I#6) - Victor watched a newsreport about Captain Wonder's recent heroic exploits, including saving a malfunctioning space shuttle, along with Dynamic Man, Witness and the Phantom Reporter. (The Twelve I#9) - Moments after he'd opened the door for Master Mind Excello, who had returned because of an important premonition, Victor answered the door a second time. He was greeted by attorney Dan Rosen who informed Jay that his wife Betty Goldstein had passed away last night. The news shattered Mister E who retired to his room where the Phantom Reporter would later drop by in an attempt to comfort him. 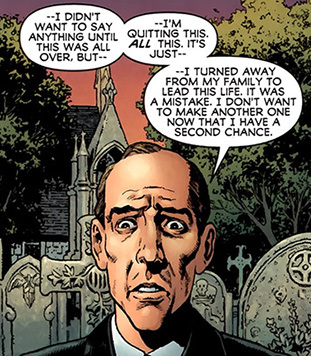 (The Twelve I#10) - Victor Jay attended the funeral of his wife and even got up to speak. For the first time in his life he acknowledged his Jewish heritage in public and apologized for causing his family so much pain. After the service, his son Robert approached him and made amends. He told him the military had called during the ceremony requesting his presence back at the mansion, adding that he wanted his father to come back home as soon as the matter was resolved. Once he was back at the mansion, Victor bore witness to the Phantom Reporter and Master Mind Excello revealing that their robotic ally Electro wasn't responsible for the Blue Blade's death. They proved that the automaton was being influenced at the time by Dynamic Man, who was a sexless android himself. Infuriated his true, inhuman origin was uncovered, the superbly powerful creature vowed to kill every last one of them. (The Twelve I#11) - Victor kept out of the fighting, but was eventually trapped with the others when Dynamic Man destroyed the support beams of the house causing the structure to collapse on them. Thanks to Rockman's strength, everyone escaped unscathed even though Rockman himself seemingly perished underneath the vast amount of rubble. After the Dynamic Man had been dealt with, by Phantom Reporter who had taken over the deceased Fiery Mask's powers, Victor announced he would be retiring his Mister E identity and return to civilian life now that he'd been granted a second chance. The others wished him well. Comments: Created by Joe Cal Cagno (writer), Al Carreno (pencils & inks). The Twelve were found in Germany on Wednesday August 2nd, 2008. This was during the rise of the Initiative in comics. The date is topical. In the original 2006 Appendix profile, LV commented on the fact that Mister E didn't receive much of an origin during his single 1940s appearance. It would take 60+ years for J. Michael Stracyzinski to flesh out the character when he wrote Mister E in The Twelve. LV also noted that he is an established crimefighter because the villain, the Vampire claims he was his old arch-enemy. LV went on to state there's also nothing especially interesting about Mister E: "He's not even a very good mystery man, since he gets run off the road, ambushed, captured, and fought to a draw -- all by one single villain working without accomplices. The city in the story is never explicitly named, but the abandoned house is in the "West Forties". Mister E received profiles in Official Handbook of the Marvel Universe A-Z HC#14 and Marvel Mystery Handbook 70th Anniversary Special#1. Original 1940s profile by LV, updated and expanded by Norvo.